Skin care products are expensive – especially the better quality ones! And yet, we all want to make sure we are spending those dollars wisely. How do you find cost effective skin care products and know if you are getting your money’s worth? 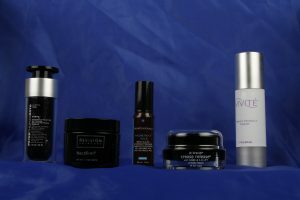 And, how do you know if these products are the best ones for your particular skin??? Here are some thoughts! Size does matter!! Look closely at the photos below. What you see is not always what you get. Some companies package a small amount of product in a large container to make it look like more. And some companies package exactly the same amount of product in a smaller, lighter container. You can see for yourself that it helps to read the labels and compare the sizes if you are on a budget and looking for the most cost effective skin care products. 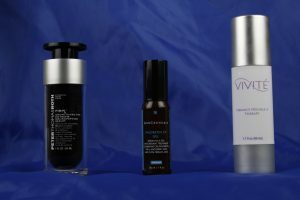 The Vivite (far right) and Nectifirm (2nd from left) are the same, the SkinCeuticals (center) and Thomas Roth (far left) are the same, and the Brandt product (2nd from right) is half. The two on the left contain the same amount and the one on the right is almost double those two! The Nectifirm on the left is clearly a little larger but would you guess it contains more than 3 times the product on the right? 1.7 ounces versus 0.5 ounces? Once you’ve identified a good value, cost effective skin care product, how do you add it to your regimen and evaluate whether it works for you? Treat any dermatology medical problems. The best product regimen will be difficult to evaluate if your rosacea is raging out of control, or your acne is flaring constantly, or your face is red and irritated due to eczema. See your dermatologist for the proper medications and give them at least 2-3 months to work before adding any new products. Also, take your basic regimen above in with you to the doctor and make sure the medications will work with the products you are already using. How to test a new product to tell if it’s working. Once you’ve established a good basic regimen and treated any skin diseases, now you want to figure out which anti-aging products work best for you. No matter how much product you get for your dollar, a product that doesn’t work for your skin is not cost effective skin care! Remember that you have to test a product for at least 8-12 weeks to tell if it makes a difference unless it irritates you. If a new product is stinging, burning, making you red or causing itching – stop the product!! You may need to see your doctor if you have reaction. Now, buy ONE new product at a time to test it. Some products are most effective under moisturizer and some more effective over it. Be consistent! You won’t be able to tell if you don’t use it regularly. 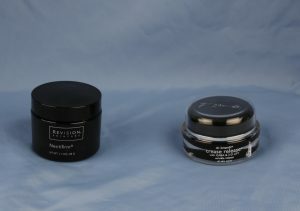 Even better is to put the new product on one side of the face and not the other; but many people find this hard to do. If, after 2-3 months, you can’t tell a difference and it’s expensive, and there’s not a good reason to keep using it (like a lot of science behind it), go ahead and quit and try something else. Cost effective skin care products are only the ones that actually work for you. Samples are generally worthless. We all seem to love samples but in general they are worthless. Using a sample just tells you whether or not you’re allergic to it or irritated by it. A sample can’t tell you if the product will really work for you. Next, see Dr. Irwin’s personal skincare regimen! Does packaging matter to keep the potency of the product?